M248 | 932 m. | 3058 ft.
Now, after having successfully reconnoitred the locations of all roads to all the dammed lochs in and around upper Glen Lyon on an earlier day, we made it to the Loch Daimh dam (Giorra dam) without a problem. 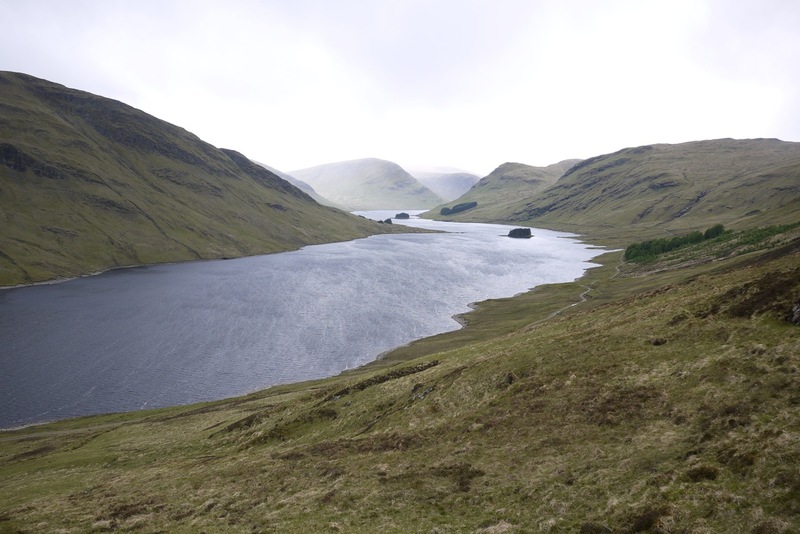 We had intended to do the high-level tour of Loch Daimh and bag both Munros on the circuit. However, the prospect of close to 20km of ridge walking quickly lost its appeal when we donned our gear in driving rain and strong wind even at glen level. We chose to climb Stuchd an Lochain first. So we used the land rover track on the south shore of Loch an Daimh and as the books say picked up the path which leads to point 887m on the east ridge of Stuchd an Lochain. After the initial maybe 500 metres of easy going the path changed its character and turned into an unrelenting grind up the steep slopes of the mountain. The path surface is of a deplorable quality. It’s more like walking up a deep scar filled with scree, earth, loose rocks, bog and sand. Often a combination of all these within a few yards. Thank providence that it was not too sodden since the rain had been not so bad the day before. With considerable effort we reached the uppers parts of the hill and bumped into the one or two steps on the ridge which had to be surmounted before reaching point 887m. There a very strong wind greeted us. From point 887m the obvious continuation along the ridge was the next point on the agenda. When the elements gave us some respite for a few seconds we looked down into the northern corrie way below us and caught a glimpse or two of Lochan nan Cat (why are so many lochans called by this funny name?). In about 25 to 30 minutes we reached the summit slopes of Stuchd an Lochain which we duly climbed to the top, touched the cairn and spent not one thought on descending via the interesting north ridge of the hill, since steep grass and exposure on a narrow ridge crest can become creepy in high winds and driving rain. We retraced our steps to the car. On this return leg of the hike the wind helped us a bit to get down the hill more quickly.